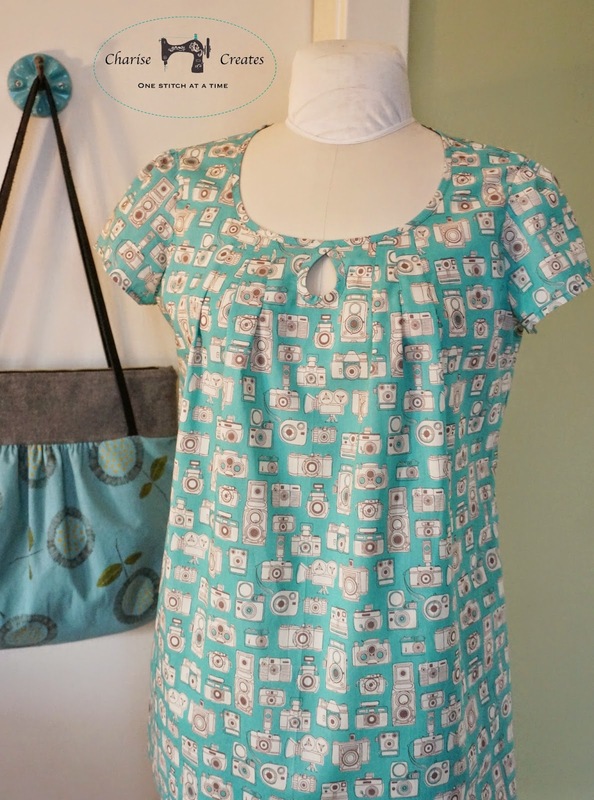 I have some fun sewing to share today. I have been working away on the instructions for my Anna blouse and making another short sleeve sample to help me write the instructions. This project has been going on for - dare I say - a year, yikes! It has been quite the learning curve with the hardest part grading the pattern on my IMac using Adobe Illustrator (turning the size 10 into size 2-18)! My experience is drawing in Illustrator so it took some time to learn how to grade the pattern. I am so excited to finish because I have ideas for so many more garment patterns I want to make. 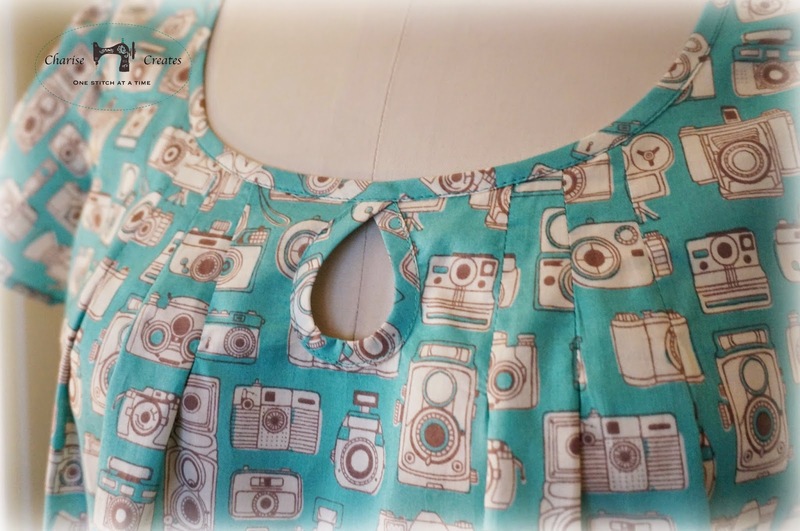 I was going to use photo instructions for sewing the blouse together, but after asking my IG friends their preference between photos and illustrations, the overwhelming vote was illustrations. 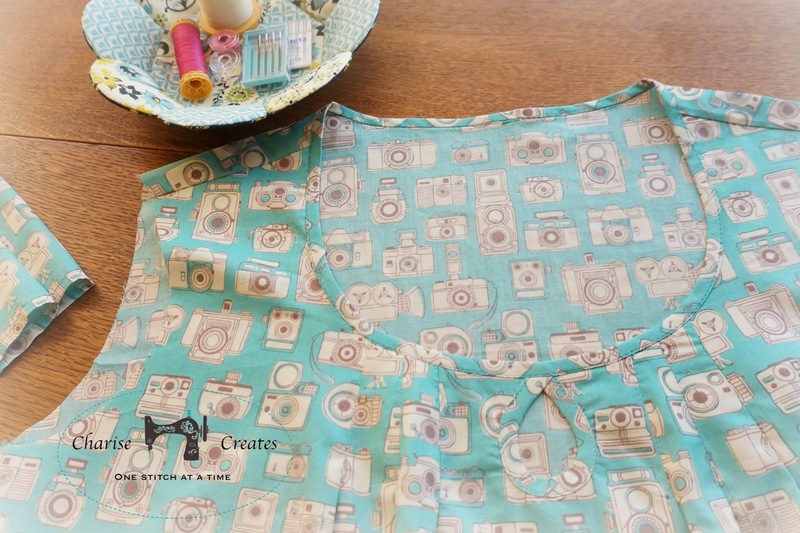 I purchased this adorable Kokka Camera Fabric a few months ago and am so excited to put it to use. It is a gorgeous shade of blue - a beautiful turquoise blue. You can find it on sale here! So sorry, it is sold out. If I find a source I will update this post. The scale is fairly small - cameras are about 1" - 1 1/2", so it is a perfect fabric for quilty projects too. I have been working on my "Scrappy nine Patch" and have decided to add a rather interesting border so this will not be done any time soon. I think it will be worth it though - spending a little extra time to get the exact look I want! I'm still looking forward to this pattern! It must be very tricky--you should be proud! Thanks Amy : ) I am so close!!! I think I will be able to send to you in Feb - hopefully the first part of February! This looks like a great every day blouse. Looking forward to the pattern. I'm so excited for the pattern Charise!! I like this Anna blouse so much. I want to make it. Let us know when it's ready. I love the blouse style and the fabric. That is one I would love to make.